I can’t believe that yet another week has passed and we are now starting week six here in Jinja. We’ve been enjoying warm days with an occasional downpour and thunderstorms at night. I can’t even describe how beautiful the thunder sounds here. The low and constant rumble is like a symphony. The rain always comes down like it’s being poured from a bucket. I like to be out side in the rain, but I usually end up soaked within seconds. Oftentimes, it’s like a flash flood! I will definitely miss the thunder though! An update for those who were praying: Tolufina is doing much better! 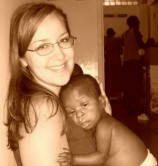 She contracted malaria a couple of weeks ago and was so weak she could hardly move. I took care of her for a few days, feeding her, giving her the required medications, and bringing her home at night for extra care. After my last update in which I told you about my first night with her, we went through a few days of her spiking fevers and not eating or drinking much, I guess her malaria was pretty advanced. Anyway, she’s regaining her strength and is starting to play a little more! *As a side note, sometimes we forget that we’re actually in Africa until something like this happens. We pass the store or post office, see the man sitting out front with a rifle in his lap, and remember that this is far from America! Commuting with chickens, riding around on bicycle taxis, power outages, stepping aside to avoid cows crossing the road, outdoor markets… all of these make up the beauty of Uganda. When we arrived in Kampala, we found that the Friday market was closed, so we headed to the Mall and spent the rest of the day there. The best thing about the mall is the grocery store in which we can find so much more as far as ingredients and spices than the little grocery stores in Jinja. On Saturday night, I brought little Sophia home for a sleepover. The only problem with sleepovers is that we can’t bring more than one at a time, each, because everyone has to be under a mosquito net at night. Sophia is, as put by one of the girls on staff, quite the little diva! She came to the cottage very malnourished and “a bundle of sticks.” She is now a healthy and strong 3 year old. The saddest thing is that, though you’d never know by looking at her, she has full-blown AIDS. Check back in a few days, I will be uploading pictures as soon as I can. Yesterday, I brought some nail polish with me and after the toddlers got up from naps, Ruthie, another volunteer and I, painted all of the girls toenails. One of the “mamas” even insisted on her nails being painted as well! Oh, the simple pleasures! I am so amazed by life these days. What a gift it is and how we ought to use it wisely. Life is so short and, like I’ve said before, eternity is so long. What are you doing with your time today? Make every second count! I don’t have any idea what my future holds, but I do know who holds my future, and I am so excited to see what He brings about. It’s like an amazing book. God has so mercifully blessed by allowing me this opportunity. I don’t deserve his abundant love, mercy, and kindness! I pray that you’re having a blessed week. My thoughts and prayers are with each and every one. Please continue to write, though I can't always write back, every letter means more than words could ever express!